As temperatures rise and family and friends come together to celebrate the Fourth of July holiday, grilling outdoors can provide the perfect combination of playing host and feeding the family. You can do this all while still enjoying the warm summer air here in Northwest Texas. As any good griller knows, though, using a propane gas grill is not a task for any amateur cook, and should not be taken lightly. In the excitement of it all, it is still crucial to remember that safety comes first. With the help of these safety guidelines from your North Texas propane company, you can ensure that you and your loved ones enjoy a fun, safe holiday to remember. It may seem obvious, but propane tanks should always be kept outdoors, in fresh, open air, and always in an upright position. Make sure to keep your grill within a safe distance from the exterior wall of your home and never near any bushes, shrubbery, or flammable materials. Before lighting your tank, it is always key to do a quick spot-check, searching for leaks or any physical abnormalities you may notice on the tank itself. Never make any modifications or alterations to the tank yourself. Our helpful team of tank installation and maintenance professionals will be more than happy to assist you in any of your propane needs. It’s what we’re here for! Refrain from smoking near your residential propane tank, and never use matches or lighters to check for leaks. In the case of fire, contact your local fire department immediately. Do not store your propane tank in any enclosed space, such as your car or truck, as this will expose it to high temperatures. If it is your first time grilling this summer, and your tank is feeling less than full, you might be in need of a cylinder exchange. 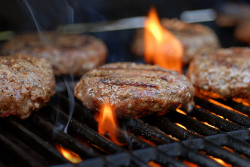 When it comes to propane grilling, use these simple safety tips before throwing on the first burger or hot dog. For any additional questions or comments, feel free to contact our Dallas propane experts today at 972-247-6121 or schedule propane service online.